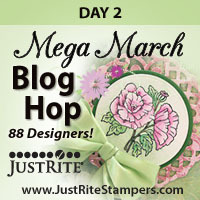 I am way excited to participate in the the JustRite Stampers Mega March Blog Hop. There are some amazing prizes available, so if this is your first stop, be sure you start at the beginning and check out all the details on the JustRite blog. Today, I have two cards to share with you that I created using the My Garden Borders and Centers stamp set from JustRite. punch, markers, dimensional adhesive: Stampin' Up! Thanks for stopping by, and don't forget to leave a comment for a chance to win one of the fabulous prizes listed above. LOVE those flower cards!!! I just have to have those!!! Your cards are so pretty! Love all of that pink! The top card is my favorite! Beautiful pink cards! Love the little extra touches...pearls and lace. These are lovely! The second one with the quilted pattern is awesome! Gorgeous...I love the Just Rite flowers...so pretty!! I love your projects. Great happy colors and details!! Your new cards are so beautiful. I love the details. I LOVE all of the pink! Your second card is my favorite with the circle around the flower! Beautiful!! OH...these are both so beautiful! Amazing designs! Beautiful cards and would love to win the stamps. Beautiful cards! Great design and just the perfect colors! Wow! These are beautiful! TFS! Amy these images just seem to pop right out of each card. Beautiful. Beautiful cards, the first would be perfect for Mother's Day. Loved the sweet girly feel of your cards! Such delicate job! So pink and so pretty! Stunning cards... love the pink. The second card is my favorite. It's so soft looking & all the details work so well together. GREAT JOB! I think that these are very pretty cards. They are so soft looking. Both cards are extremely pretty....wonderfully done! I just love pink, so oooo, oooooo, oooooooo! These are right up my alley. Beautiful! Love the scalloped edge with pearls on it on the first card. Darling second card too. I LOVE Pink. They are so soft and sweet. Great Job. These are both very pretty. I love these flower stamp sets - on my wish list...! TFS! I love your cards and the pearls are a perfect addition. Absolutely beautiful! Love both gorgeous cards!! Both are so pretty....I really like the paper piecing on the 2nd one...quilt feel. Love the cards! I love pink!! !LOL Robin P.
Lovely cards. Pink is always pretty. Your cards are beautiful! TFS!! Love your use of pink! Very pretty in pink! I love 'em. I love that quilting! Very nice! Great cards. Love the first one. Very feminine. That card with the pearls is just SO girly & perfect!!! Beautiful cards-I especially loved the pink one! ohhhhhhhhhhhhhhh, These are just gorgeous! Oh, LOVE, LOVE that first card -- simply perfection!!! These cards are just beautiful...very creative and love the pink! Children are precious too! Really beautiful cards! I especially love the first one....so pretty! TFS! These are absolutely stunning, Amy!!! This is a lovely card and good job!!!! What great cards! Thanks for the opportunity to win some candy! Patchwork, ribbons, all my favorite things! all equally beautiful - can't choose which is the best! These cards a very pretty!! Thank you for sharing!! Love how you added a flower to the ribbon center - very sweet. these are so sweet!! love all the pretty pearls! Those are both so beautiful!! I love the little flower on the bow especially. i love the pearls and scallops - the pink makes me think spring! Loving all the flowers, So perfect for Spring! Both of your cards are pretty. Pink, pearls, flowers and ribbon. You can't go wrong. Pretty and pink! Thanks for sharing. What beautiful cards you have made. I love your style. Just gorgeous!! I really love then both! Love the pink card. So feminine. I love both of these cards. The additions to each of the bows are great. I'm going to have to case those ideas, especially the one with the flower attached to the bow. soft and pretty in pink ! Love the samples and all of the pink. Beautiful colors and wonderful coloring. I need lots of practice so I am in awe of those who do such beautiful work! I love these cards. Thanks for sharing. So beautiful Amy! Thank you so much for posting about this blog hop yesterday on your blog! I've been having so much fun and I am in awe of all the talent! These are sooo great. TFS. both cards are beautiful and I can especially see the second one as a baby shower/gift card. Beautiful cards. Pink and yellow are such a great color combo. Pretty cardsS! I like the pearls you used on your first card, they add that extra special touch! great cards!!! I love the pinks. I am loving this pink in these projects. Like how you took one of the flowers from the image to accent the bow. Very cute! Your cards are so pretty!!! love them all - and I just love pink! These are both beautiful. I love the pink. BEAUTIFUL!!!! Love these Just Rite flowers!! I am not a "pink person", but I love these cards! I really like the monochromatic look of the first card and the quilt on the second. Beautiful work and great colour co-ordination. Thank you for sharing. wonderful cards, love the sentiments. Both cards are so yummy!! TFS! I love both of your cards. 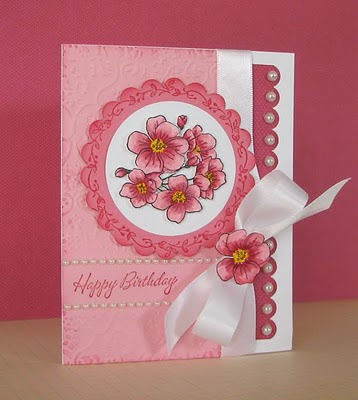 I wouldn't necessarily think of a pink and red color combination, but that birthday card is gorgeous. Love the quilt one too. Thanks for sharing. Beautiful cards, especially that first one. It is one of favorites of today's hop. I love the beautiful cards. Make me want spring to start now! Both cards are beautiful Amy. Love the colors. I love both of your cards. They are just so springy and cheerful. Thanks for sharing! Beautiful cards. Love the quilt pattern and the colors are so pretty. Thanks for sharing. Lovely, lovely cards. Great coloring. Lovely pinks. So fresh and spring-like. Great cards!!! Love the pinks and colors used on both of them!!! Thanks for the inspiration. You had me with the pink and then you added the pink and green. My fav colours! Both of your cards are so pretty. Oh my goodness, your pink cards are luscious!!! Love your pink card with flowers. Very nice. Great cards... and perfect for spring! Very pretty. I especially liked the top one. WOW! Really pretty cards. Thanks for the inspiration. I love the pearls and lace you used! Amy, this is my first visit but not my last! Your cards are gorgeous! I love the pink and white -- each detail is just fantastic! And I love the quilt card too! the pink on the kraft! I'm drooling! Your cards are so pretty and fun. Very sweet cards. I especially love the color combinations you used. Think pink! VERY pretty cards! I love the stitching. I really like both cards, but the first is my favorite--so feminine and pretty! Pretty, feminine colors - I love pink! Your coloring is beautiful! Gotta love the pink! Great cards. great cards love the spring colors. I love both cards! The pink is so springy too! Just lovely! Your color choices are perfect. Thanks for sharing the inspiration. ooooooh.... Love those colors. Inspiration overload....off to my craft room! Very, very nice! Love the quilt look. I especially love the pearls and the little flower on the bow in the first card. Both cards are lovely. I especially like the first one. Your coloring is beautiful and your design work is great. Thanks for sharing. Love the coloring and colors of both cards. I am partial to the kraft cardstock and love the quilting on the second one. This is really pretty. love the pink! I love the pearls and ribbon! I think the quilt card is adorable! I love the way you used one of the flowers as an accent on the first card! Great projects! Two beautiful cards...love your accents and the pinks...so different...thanks for sharing! Beautiful cards! I love all the pearls and how you used a flower in the center of your bow! These are really lovely cards. I love the flower in the bow! Lovely cards and I love the colors. Thanks for sharing. So pretty! Love the pinks on these cards. Thanks for sharing. What lovely cards. The pink is delicious! Love your cards and the colors. My fav is the second one with the quilt look on the bottom. Both cards are lovely, would have a hard time making a chose between them. These are both AWESOME cards! I love the paper! I love both cards! The colors are great. Pretty in Pink!!! So beautiful!!! thanks a lot for sharing with us!! Lovely cards--I especially like the quilted one! Love the pink goodness here! 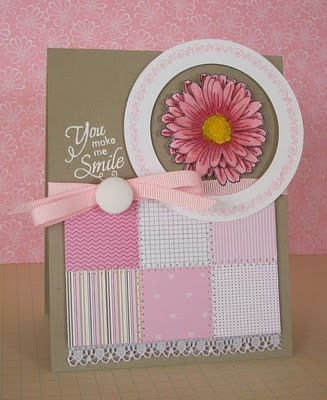 Amy, absolutely love the shades of pink you have used in you cards. Really dainty and girly!!! What wonderful cards you made!! I love them! !